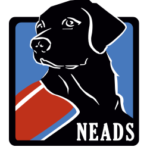 If you would like to write or film a story about NEADS, please contact our Communications Department. Franciscan Children’s Hospital’s newest employee, Marcus, had an excellent first day on the job. He did spend much of the afternoon yesterday gobbling treats out of the nurse manager’s hand. Marcus is a 20-month-old black lab who has been trained to act as a therapy dog for the pediatric patients. There’s a celebrity at Ralph Wheelock School in Medfield. He has his own mailbox, he gets extra recess time, and he’s Mr. Popularity. His name is Franklin. He’s a 3-year-old golden retriever-yellow lab mix.